This is a deck that I actually had not played since Winter Regional Championships of last year. I had been building Virizion EX/Genesect EX decks throughout each of the past formats, but it hasn’t been a deck that I ever felt like it was the optimal play. The deck is fairly simple and straight forward in its strategy, which means if someone wants to build a counter to it, they could. For most of the past year I had avoided the deck after playing it quite a bit immediately after the release of the cards. However, after an opening start to City Championships with a 3-2 performance with Yveltal EX/Garbodor DRX, with all of my losses just being a result of dead drawing, I knew for my second City Championship of the season, I didn’t want to deal with losing because of dead draws again, so I built the deck least likely to have that problem, Virgen of course. This is a deck that I probably should have played much more over the past season, and also a deck that I see likely having a place as at least a Tier 2 deck in the format until the cards likely rotate out of the format this summer. The only thing that would knock this deck out of playability is the a Fire deck emerging as a top contender, seeing play in numbers similar to Yveltal and Donphan during the current City Championships. The reason the deck will most likely always be good? It hits on ALL of the major characteristics that great decks tend to just have some of. It has built in, reliable gust of wind effects, giving you control over your opponent’s board. It can easily hit the magic numbers of 130 and 180 thanks to Muscle Band and Deoxys EX, as well as Genesect EX’s snipe with Megalo Cannon. It has access to a OHKO attack (save for Mega Pokemon) with G-Booster. 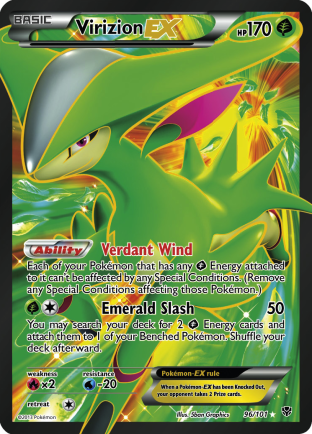 And then Virizion EX’s Verdant Wind Ability protects you from Status Conditions as well! Additionally, the deck has a lot of space, which allows you to build it flexibility for the current climate of the meta game. The skeleton Pokemon line of the deck is just 3 Virizion EX and 3 Genesect EX, which gives you a lot of options on how you build beyond that. 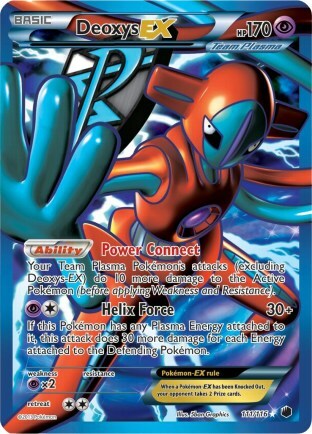 We have seen an example of this recently with players using the open slots of the deck to include Deoxys EX and Drifblim DRX to improve the deck’s Donphan matchup. The decision to play the deck paid off well, as I went 5-0-1 in Swiss and entered Top 8 as the #1 seed in a 58 player field. I won my Top 8 match against Aromatisse XY/M Kangaskhan EX, and then lost in Top 4 to M Manectric EX/Fighting to finish in 3rd place. The list I would use for the tournament was something that I wouldn’t have any time to test. I don’t own playsets of Virizion EX or Genesect EX on PTCGO, so testing the game on there was not an option, and I’ve grown to dislike the other online testing options, so I would just have to do my best to make a strong list without the aide of testing to help me fix any mistakes I made, and hope things went well the next day. 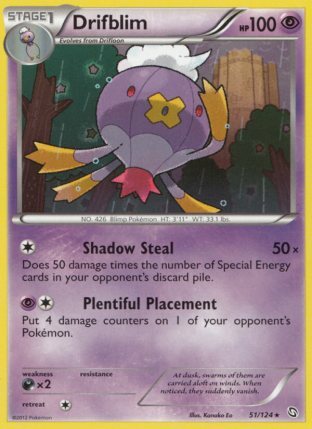 For guidance, I looked at the Virgen lists played at the World Championships that were listed on Pokemon.com. After looking the lists over, I decided I especially liked Igor Costa’s list, and agreed with a lot of the decisions he made in his list. His list of course contains rotated cards, and would also need to be updated to include strong new Items and answers to the current meta game, but I feel that I kept the original spirit of his list alive in mine. There is a lot of standard stuff in this deck list, as is the nature of all Virgen decks, so I will just try to explain spots where it might deviate from what you expect from a Virgen deck, and why I liked the things that way. I only went with 3 Virizion EX, as you never really need four in a single game, and when you start including multiple tech Pokemon beyond the base Virizion EX/Genesect EX, the return on including the 4th Virizion EX for the consistency is much less than something like the 4 Virizion EX/3 Genesect EX lists that were being played last Spring. Shaymin EX has always been a favorite of mine for this deck. It gives you great comeback potential when your opponent takes prizes quickly, but doesn’t do much to establish great board position. It has a two Energy attack, and without Super Rod in the late game, that might be all the Grass Energy you have left to use when setting up a strong 3rd attacker for a match, so in some situations that factor comes into play. If you can force your opponent to take the odd prize in the Drifblim, you can do 180 damage with Shaymin EX’s Revenge Blast when your opponent goes down to one prize, but even if they stay on even prizes, you can do 170 damage with a Muscle Band which will still KO most EX’s. The inclusion of Deoxys EX and Drifblim DRX are mostly for the Donphan matchup. Deoxys EX lets you hit for 130 on a Donphan with Megalo Cannon when you have a Muscle Band attached, which lets you OHKO a Donphan. 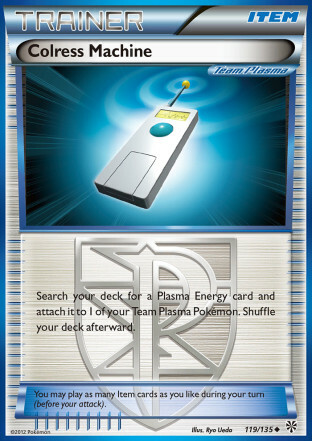 This is also useful for hitting the KO numbers on stuff like Zekrom, Kyurem, mini-Yveltal, mini-Xerneas, etc. Drifblim is especially great in the matchup as Donphan is unlikely to OHKO it, which means it will take two KO’s when it’s active in most situations, and as its not an EX, your opponent will be unable to attack it with their Hawlucha. My general strategy against Virgen was to go after Donphan’s with a pair of Genesect EX, and let my opponent get down to 2 prizes left, and then begin attacking with Drifblim, while setting up a 3rd Genesect EX to finish the game with. Even though it’s just a 1-1 line, and I have no means to recover a part of the line if I have to discard it early, that never got in the way against Donphan, as I would just make sure to get Drifloon out as quickly as possible whenever I saw and Ultra Ball to try to avoid such situations. I really enjoyed Igor’s decision to play Bicycle in place of Colress in the deck. Being able to use a Supporter like Shadow Triad or Lysandre, and still be able to get some draw out of a turn was great, as well as the option to turn Skyla into a draw supporter in a way. One card notably absent is Professors Letter. The card certainly adds consistency to the deck, but with 9 Grass, I feel like you are already at a high enough Energy count where the probability is good enough that the space for that card would be better utilized elsewhere. The biggest change from Igor’s list was the inclusion of Switching cards, as Skyarrow Bridge had rotated out of the format. For these, I leaned heavier on Escape Rope because I wanted to minimize the risk of losing a turn of taking prizes as a result of my opponent having a Robo Substitute active. With Colress Machine and a high Energy Switch count, I felt the deck was highly explosive. It felt as if with these cards, after getting a base setup, I could stream G-Booster together consecutively until the game was over, or setup new Genesect EX’s consistently, keeping a consistent chain of attacks. If my memory serves correct, I only used Emerald Slash more than once to start a game, just once in the entire tournament. 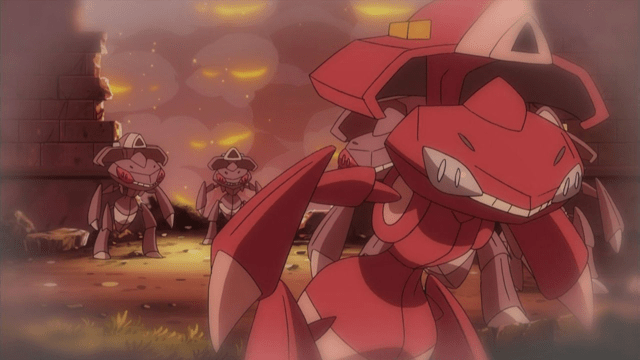 I would go into attacking with Genesect EX on turn 3 to put a lot of pressure on my opponents, and was generally able to have a Genesect EX attack for the rest of the game thanks to Colress Machine and Energy Switch. This was by far the most aggressive Genesect list that I’ve ever played, and I felt that added aggression served me well in this format. The last card I want to highlight is Tool Retriever, which is a very strong inclusion in this deck. 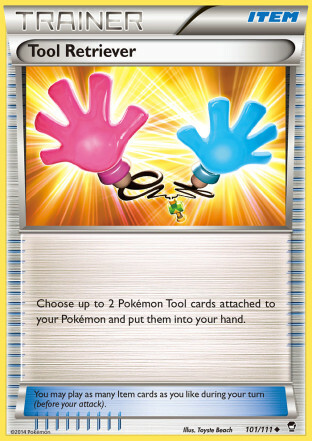 This is a deck that can be shutdown by Head Ringer, so being able to remove those is super important. Between Energy Switch and Tool Retriever, I was able to navigate around all of my opponents who used Head Ringer successfully. 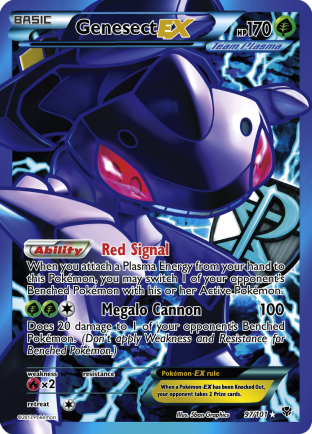 An additional benefit of the card is to move your Muscle Bands to new attackers, as well as to take G-Booster off one Genesect EX and place it on another, or attach it to a Pokemon to avoid discarding it, and then retrieving it to put on a Genesect EX. I think this is a very good list that should give you a good base for using Virizion EX/Genesect EX in this format. The deck performed great for me in the tournament I played it at, and the concept which it was taken from worked greatly for Igor Costa at the World Championship where he placed 2nd. While Virgen has seen much less success this format as it has in the previous few, the deck is still very much viable. The format is definitely less friendly to the deck than it has been in the past, but the deck still doesn’t have too many terrible matchups. I think what has happened with this deck, is that it used to have a bigger power gap between this deck and some of the other decks that were seeing play, but now the margin between this deck and the other highly played decks are much smaller, which creates a much smaller margin of error necessary to do well with the deck. Because of this, even minor misplays will cost player games that they wouldn’t have in the past, and with tighter matchups, sometimes game outcomes will fall out of a players hands and just come down to the opponent drawing slightly better than you, which the deck had much more cushion against in the past. The deck is still a very powerful deck, and while it has fallen from its BDIF status, it’s still one of the top contenders.